Controlling and dosing the oxygen gas flow with the DY112. The flow regulator DY112 is specially designed for the use in fish farms. 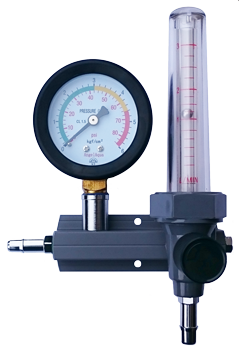 With the adjustment wheel you can tune the flow while the pressure gauge informs you about the operating pressure. The flow regulator DY112 is the optimal combination product for oxygen regulation systems with the SENECT control units.